Gregory Astill, PhD Economics, Economic Research Service, U.S. Department of Agriculture. The views expressed are the author’s and do not necessarily reflect those of the Economic Research Service or the USDA. Ever struggled with deciding whether to invest in new technology, and which of a range of technology options would be a better fit to your operation? 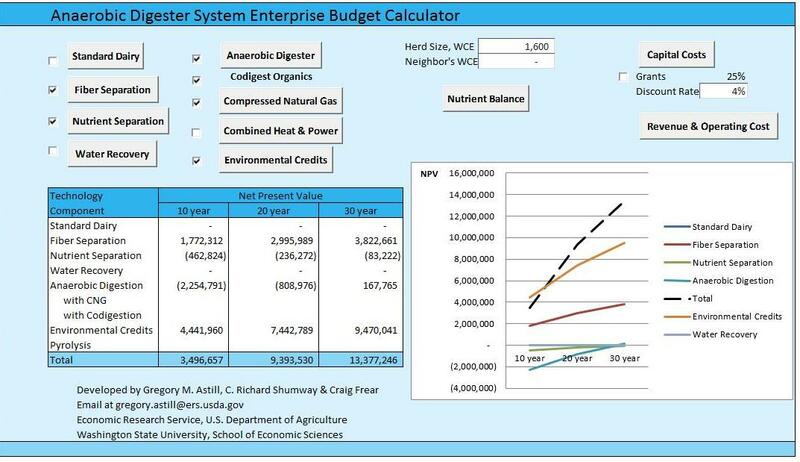 The Anaerobic Digester (AD) System Enterprise Budget Calculator is a tool that is intended for dairy owners, AD system industry experts, and AD researchers to explore such options. The tool will calculate the net present value of your investment in an AD system, under specific technology and price scenarios. And though we cannot guarantee that you will achieve the results generated by this tool, you can explore the economic benefits of different AD technologies. 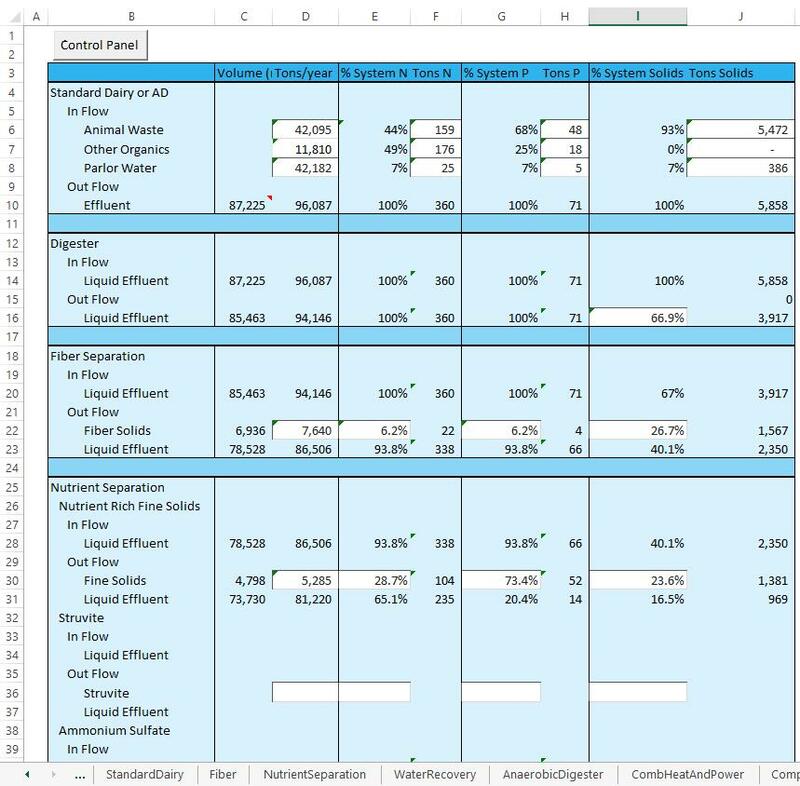 Just make sure that all price, input and output quantities, and other details accurately reflect your unique situation. 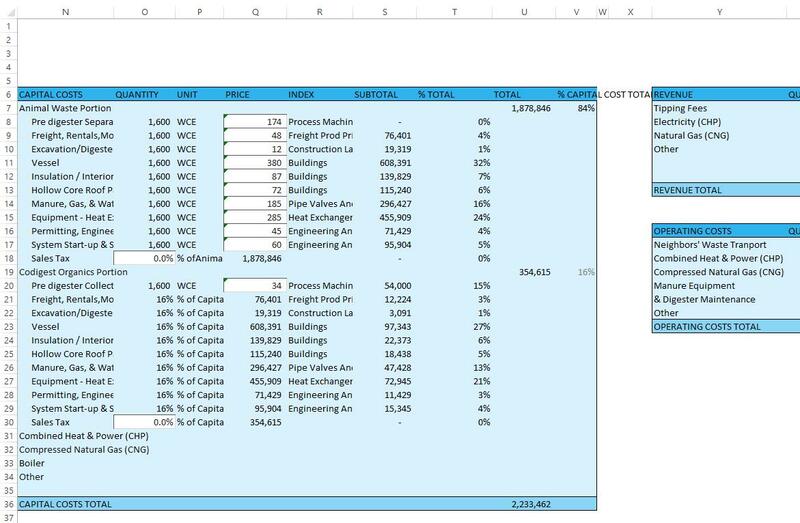 Let’s get started with an example that shows the basic operation of the budget calculator, the results it provides, and how you can change some of the built-in assumptions. Note that these assumptions are what we, researchers at Washington State University in 2015 (where I was working on my PhD), deemed reasonable, even though we know they will not hold true for every operation. 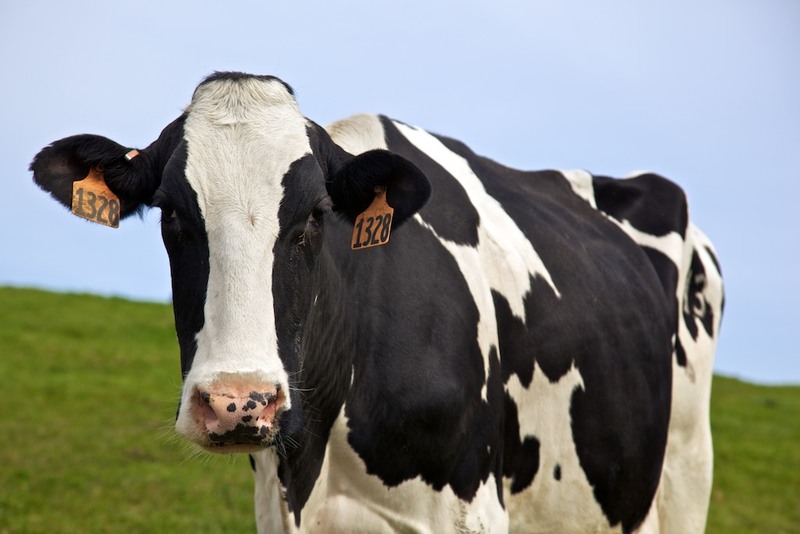 Say you are a dairy farmer with a 1,600 cow herd, and you’ve been talking to a food processor in a neighboring town who is looking for someone to take their waste. Until now you have been spreading manure from your lagoons over 600 acres, but are worried about over applying nutrients if you accept food waste into your digester. The price of bedding you use has also increased significantly over the last two years. You want to know (a) what is the net present value of an AD system if you had 1,600 cows? (b) is it worth trying co-digestion, given the local sources of organic waste? (c) how effective would you need to be at recovering nutrients from manure? Here’s how the budget calculator can help you explore these questions. The net present value of an AD system if you have 1,600 cows: In the Control Panel (Figure 1) you plug in your Herd Size of 1,600 cows, you select the technologies and details you are planning to include—say anaerobic digestion, fiber separation, compressed natural gas, and environmental credits—and voila, the calculator shows you a graph of net present values (NPVs) of the entire AD system, along with the individual technology components’ NPVs, for investment lifetimes of 10, 20, or 30 years. Under current assumptions, the NPV is positive for all investment lifetimes. Is it worth doing co-digestion? To explore this question, you select Codigest Organics, and then click on the gray Anaerobic Digester button to provide the details. This will take you to the Anaerobic Digester Worksheet (Figure 2). You plug in the numbers you think reasonable, thanks to your conversations with your friendly food processor neighbor: you plan on accepting more than a 16 percent proportion of off-farm organic waste, and know that its biogas generation potential is higher than manure’s, at 0.37. So you change those numbers to 20 percent and 0.4. 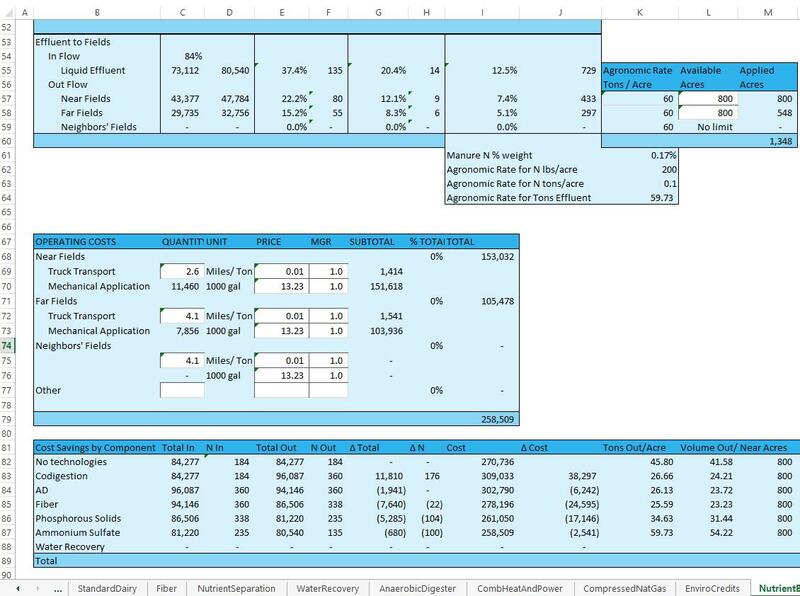 This will automatically update the NPV results on the Control Panel Worksheet. You see that, because the volume of waste input increases, the capital cost, operating cost, and revenue for the anaerobic digester increases too (you can see that in the circled values on the AD Worksheet, Figure 3). But not as much as you expected—the budget calculator assumes a per unit discount for purchasing a larger digester. As the methane output increases, so do the CNG capital costs, operating cost, and revenue; and nutrient output for the dairy operation also increases, so up go the capital costs, operating cost, and revenue for nutrient separation. 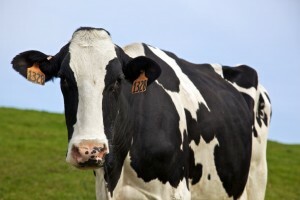 How does nutrient recovery impact codigestion? Because you are interested in nutrient recovery, you go to the Nutrient Balance Worksheet (Figure 4) by clicking on the gray button with that name on your Control Panel. 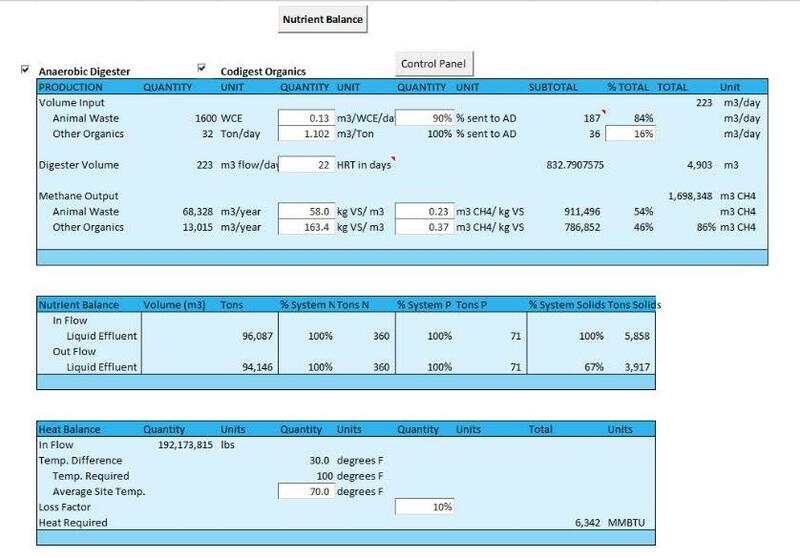 There you are able to adjust the amount of nitrogen, phosphorous, and solids present in the effluent stream and how much each filtration/separation technology removes based on the numbers quoted by the company who would install your nutrient recovery system. You confirm that the agronomic rate reported by the calculator sounds reasonable, and note that if you accept organic waste for codigestion, you would need an additional 800 acres to dispose of the effluent. Plugging in the transportation and application costs you face, you see that while you do have to pay an additional $300,000 per year to apply effluent to fields, nutrient separation reduces that cost by nearly $20,000 (Figure 5). NPV reported on the Control Panel Worksheet is still positive due to the tipping fees and additional biogas generated by codigestion. So how did the scenarios compare? As you can see in Table 1, the system with the highest NPV is AD with codigestion and without nutrient separation. In this case, transporting manure to other fields provides more value than separating out nutrients and selling them as fertilizer products. According to the amount, quality, and price of food waste accepted for codigestion, the value of the project more than doubles. Table 1. 20 year NPV for three digester systems. Join us for a live webinar April 6th at 10 am PDT with Gregory Astill. Register for An Introduction to the Anaerobic Digestion System Enterprise Budget Calculator by clicking the link and navigating to the event. If you have any questions once you start exploring your own scenarios with the Budget Calculator, send them to gregory.astill at ers.usda.gov.